This is the brand new sparkling perfume from the one and only Britney Spears. It launches today (21st September) and is a follow on from her popular ‘Radiance’ scent from last year. Cosmic residence is a sensual floral fragrance and was inspired by the idea of luminous sensuality. I usually find her perfumes a little too sweet for me, so it comes as a surprise to find this isn’t really that sweet at all and has a nice little kick to it. My best friends love her perfumes and have both gone through numerous bottles of Fantasy and Hidden Fantasy so I was thinking about gifting this bottle to one of them for an upcoming birthday. But actually, the more I smell it the more in love with it I get and I think I might have to keep it for myself! The packaging is also a massive plus for me, I’m a sucker for a pretty looking product and so this one really does tick all the boxes! 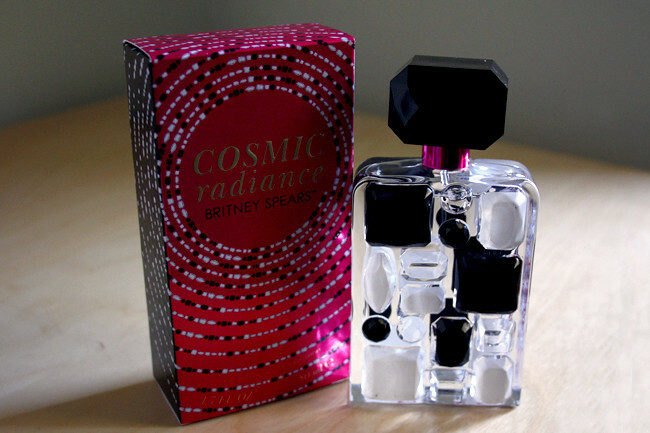 I was doing a little research on Britters and found out that her perfumes are the most popular celebrity brand out there and cosmic radiance is her 10th bottle! Is there anything this girl can’t do?! I’d love to hear what your favourite Britney music video is? Mine has to be ‘(You drive me) Crazy’ because it’s just so old school. It’s fun, cheeky and makes me want to dance! Plus, Melissa Joan Hart (Sabrina the teenage witch) makes an appearance which at the time was just AMAZING! Finally, to celebrate the launch of this lovely fragrence they are giving away the chance to win an out of this world experience with… the Femme Fatale herself! From 21st September – 18th October, they will be giving away TWO tickets every HOUR to the much anticipated Femme Fatale tour, plus one bright star will win two VIP passes to MEET BRITNEY at the Wembley London show including flights, accommodation, VIP tickets and backstage passes. HOW EXCITING?! All you have to do is click here for a chance of winning! Im seeing Britney in October all ready!! SO excited!! Glad you've reviewed this perfume cos I've always wanted a Britney perfume but didn't want it to be so sweet.. so I'm thrilled it isn't!! Britney Spears's perfumes are actually my all time favorites! I have 3 of them and i really want them all because there's not a single one of them that i don't like. Crazy. The bottles are also amazing and that's also a plus for me because i like having pretty bottles in my room :). I'm going in november to her concert here in Chile :D! I'm so excited because i've been a fan of her since i can remember. I love how the bottle looks!